"It's no fun being serious." VIFF 2018—Korean filmmaker Lee Chang-dong's very slow burn (pun intended) mystery drama loosely based on Japanese novelist Haruki Murakami's short story "Barn Burning" is a grim arthouse treatise on struggling working-class young men. Burning (aka Beoning) tells its story in supremely unnerving ways with more than a few unexpected but sombre turns. Yoo Ah-in stars as Jong-su, an unemployed creative writing graduate, who struggles with both unemployment and dealing with his father's cattle farm after he's imprisoned. He randomly gets reacquainted with an old schoolmate Hae-mi (Jeon Jong-seo) and they spark up an unusual, quirky sexual relationship before she jets off to Africa and returns with a mysterious new companion. Korean-American actor Steven Yeun perfectly cast as Hae-mi's mysterious new beau, Ben, and proves to be effortlessly cool and mysterious with his charismatic good looks and rich guy style. The trio's interactions playing off class and socioeconomic concerns inform the unusual relationship dynamics and sexual tension to a boiling point before the crux of the film's mysteries are revealed. 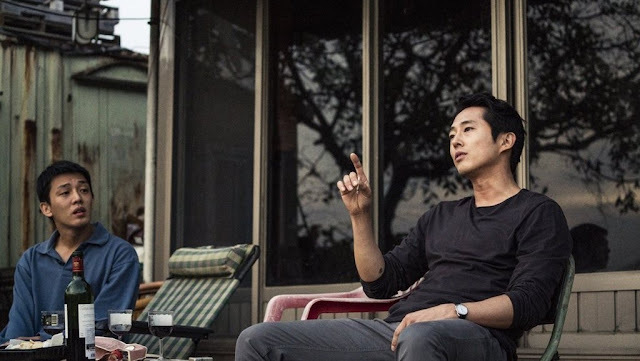 Burning is a haunting contemplative character study full of paranoia that buries its simmering mystery in a fog of male repression and cycles of violence. Masterfully filmed, its patient execution uncovers so much about its characters and human nature in the midst of quiet social unrest. Burning screened at the 2018 Vancouver International Film Festival as part of the Gateway stream.